I LOVE Roasting Vegetables. It is one of my favorite ways to eat them. “Roasting” makes just about everything better when it comes to veggies… Especially the Root Family.. This is a wonderful Vegetarian (and Vegan) Recipe for Roasted Vegetables. Super simple. Just chop veggies and lay everything on a sheet pan – add olive oil, herbs and Roast to perfection. This is a fragrant and awesome side dish for anything. Pair it with any great meat main dish and you’re set. Easy, yummy, and beautiful. 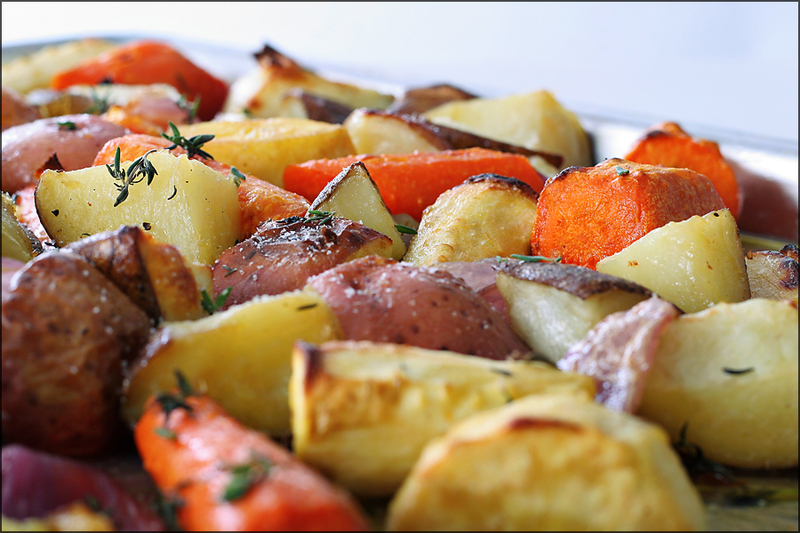 Roasting adds subtle sweetness to carrots, parsnips, turnips, rutabagas, beets, celery root, radish and onions. It’s easy and oh-so-delicious. Although the recipe below specifies types and quantities of vegetables to use, feel free to experiment with others. A savory side that’s perfect for holiday meals or anytime you need a hearty and flavorful vegetable side dish. The truffle oil is added at the end since continued heating will compromise the delicate flavor. Place potatoes, carrots, parsnips, onion & garlic onto a sheet pan. Drizzle the vegetables with olive oil. Add thyme, Sprinkle with salt & Pepper. Toss together. Place on top rack of oven and roast 20-25 min until tender. Remove sheet pan from oven, stir vegetables & drizzle with truffle oil. Place back in oven for another 5 min. Remove thyme sprigs and Garnish with Fresh Thyme if desired. Enjoy..
End up with leftovers? Doubt it, But if you do… Use it in soups, stews, casseroles, etc..